Lookit this cutie, in her brand new set of armor. girls in armor are cute. no exceptions. Agreed. 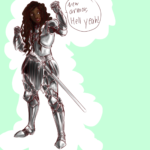 Girls in actual armor ARE cute! Reblogging a positive female example for some nice contrast with Magic Meat Week.